Hey, I know that server errors are to be expected when an online game launches. That doesn't make it any less annoying that I've been trying (quite diligently!) 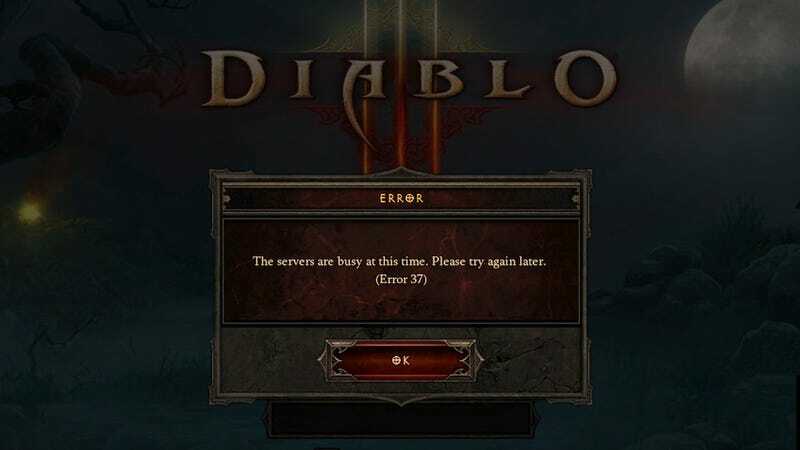 to log in to Diablo III for the last half-hour to no avail. I don't even want to play with other people! I just wanted to click some stuff to death before I went to bed, you know? Most every time I enter my password, I get the above error message. Sometimes, it starts trying to load my heroes, only to time out. One glorious time, I actually got to the character screen. Oh, it was lovely! I named my Monk (yes, you guys convinced me), but then… it timed out. Such sweet disappointment! I'm sure I'll get in soon. Actually, I'm not sure! But I'm sure I'll get in… this week. And hey! At least I'm on the west coast, so it's only 12:30 AM. If it was 3:30 AM for me right now… and the Red Bull was starting to wear off… things would probably start getting ugly. Welcome to Diablo III! The fight for Sanctuary has begun. Please note that due to a high volume of traffic, login and character creation may be slower than normal. If you're unable to login to the game or create characters, please wait and try again. We've temporarily taken our Battle.net websites offline and launched more servers to accomodate for the traffic. We hope to resolve these issues as soon as possible and appreciate your patience. Guys... I don't know how to tell you this, but the fight for Sanctuary has not quite begun yet. Update 2, 4:25 AM EST: Welp, I'm chalking this one up to the gods of immensely ambitious launches and calling it a night. It does sound as though folks on my various social media outlets are starting to get in, so things'll probably even out into tomorrow. Godspeed!